As Hawaii embarks on the complex transition from a fossil-fueled past to a clean energy future, Solar Impulse and ABB are proving that renewables are a reliable power source. Hawaii, USA, April 15, 2016 - By flying halfway around the world on solar power alone, Solar Impulse has already proven that it is possible to produce a stable, 24/7 electricity supply using only renewable energy. On the ground, ABB, a world leader in power and microgrid technologies, is helping remote communities and islands like Hawaii to meet and sustain their own energy needs by incorporating renewable and clean energy technologies into the power grid. Powered only by energy from the sun, Solar Impulse will soon begin the second part of its epic 40,000-kilometer flight around the world, taking off from Kalealoa Airport in Hawaii for the mainland United States. The Aloha State is a leader among all 50 states by pledging to power its islands with 100% renewable energy sources by 2045. 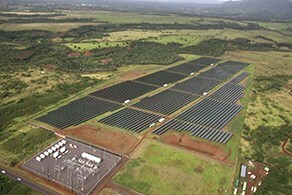 ABB technology is already helping Hawaii with that goal as a part of Kauai island's Battery Energy Storage System, which helps to maintain a stable power supply and provides instant backup power in the event of unplanned outages. "One of our goals for this historic round-the-world journey and for our technology partnership with Solar Impulse is to demonstrate that you can separate economic growth from environmental impacts with help from smarter and more sustainable technologies," said Greg Scheu, president, Americas region, ABB. "Renewable energy, microgrids, battery storage, higher efficiency standards - these all show that we can power the world without consuming the earth." "We had to build an aircraft with an extremely efficient grid: from the electric motors to the batteries and the management system," said Solar Impulse pilot and CEO, André Borschberg. "What we have is a system that captures its own energy, converts it into electricity, and stores it and manages its consumption in a sustainable way. This is exactly what ABB is doing on the ground with its distributed energy resources or microgrids." "If Solar Impulse can fly day and night around the world with no fossil fuel, it demonstrates that these technologies are now mature and ready for the market so everyone can use them," said Solar Impulse pilot and chairman, Bertrand Piccard. "ABB gives credibility to what we are doing, because it is doing it on the ground."